RLGT Style: Summer Essentials #OutfitGrid – redleafgoldteeth. I knowwww that the calendar says that its still spring, but for most college students there is only 2 seasons; Exam season, and Summer. Since exams are finally done (hopefully you and your GPA’s all escaped safely) and school is out, that means that the best time of year is here. Minus possible summer classes and work (S/O to my student loans), summer is all about hanging out, cathching up, enjoying yourself, and meeting new people. Summer has a whole different flow, and its the prefect time to enhance your wardrobe. No more grey sweats and snow boots everyday, its time for the shorts, sleeveless’, and colorful accessories! Realistically, summer is when we all swag out, and show and prove. My personal style in the off-season is reflected through colorful shoes, socks, and other standout pieces, combined with subtle helpers. 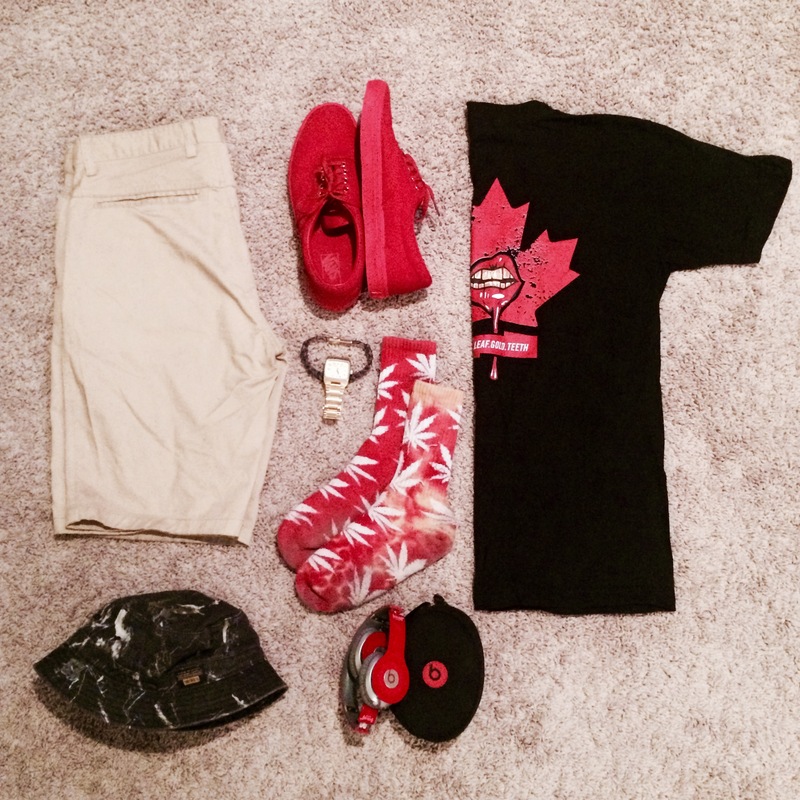 Check out my ideal summer #outfitgrid below for some ideas for your own summer heat! As mentioned earlier, and previously in my “color in the cold” Style post a month or 2 back, adding color to fits is by far my favourite thing to do. Using colorful accessories as the main focal point instead of overwhelming main options is always a good call. As you can see above by using the accents in our RLGT tee to match my shoes, and compliment the socks, it creates a reverse effect that is very aesthetically pleasing yet refreshing. Besides the clothing options, I had to throw the Beats in there because music is the definition of a summer essential. Look out for the first part of our summer playlist dropping soon! In the warmer months of the year you can get away with stepping away from the conventional monotone fits, and in my opinion I think its worth taking advantage of. As always, I stress the fact that you should wear what you like, but summer is a time to experiment (with clothes, that’s all I meant, mom) so what better time to incorporate some new fun items into the rotation? Be a taste-maker, not a taste-tester! Pingback: RLGT Style: Shades of Summer #outfitgrid | redleafgoldteeth.